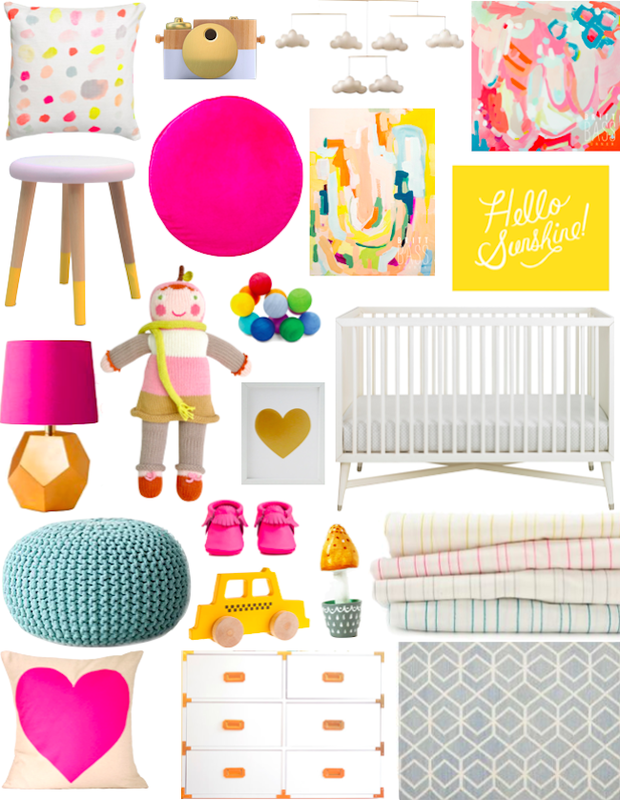 I love the idea of a bright white nursery with lots of pops of fun color and metallic accents. It seems like it would be such a happy, energizing space, don't you think? I love that lamp! A few months ago we moved our now-almost-one-year-old down the hall to our teeny tiny empty room just to see if she slept better alone than next to me (answer: yes), with a plan to move her in with our toddler when she's sleeping through the night consistently. But because it was supposed to be temporary, we've done literally nothing to pretty the space up! I decided this weekend that we might as well make it prettier for the time she's in there, and I'm shopping the house to find a nicer lamp and some pretty things for her walls, as well as making a banner with her name on it. This post has me thinking neons!